City police have received at least half a dozen reports about Ku Klux Klan fliers being left in driveways, coming about two months after similar reports in Gardiner, Augusta and Freeport. 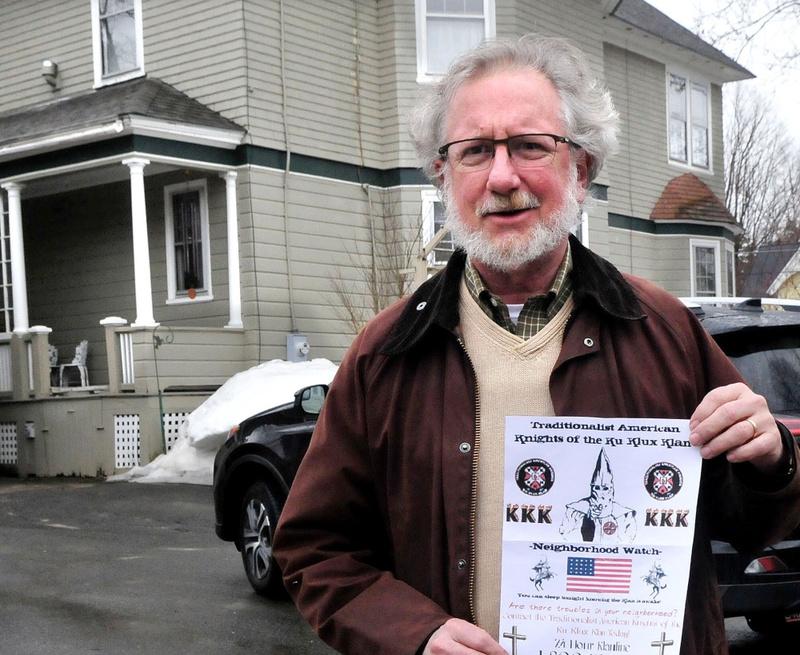 WATERVILLE — When David Anderman found a flier advertising the Ku Klux Klan early Monday afternoon in his driveway, he first felt a bit worried that he was being targeted. Anderman, a retired pastor of the First Congregational Church, United Church of Christ on Eustis Parkway, spoke at the annual breakfast honoring the birthday of Martin Luther King Jr. at Spectrum Generations’ Muskie Center in January. “I hope it’s not a precursor of something worse,” Anderman said. 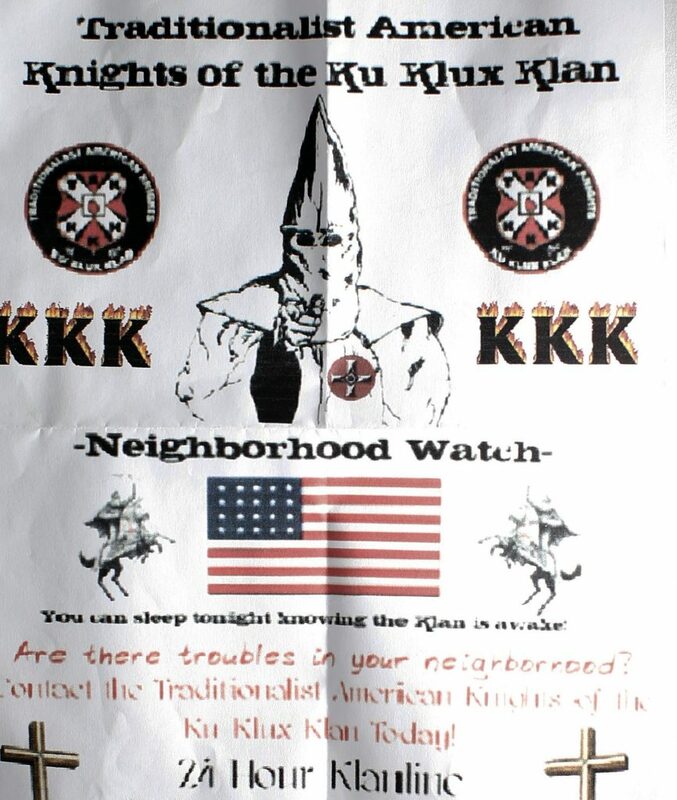 But police say they received at least six reports of KKK fliers that had appeared Monday morning on driveways in the streets around Western Avenue and Pleasant Street. The flier also lists a toll-free telephone number, which it says is a “24 Hour Klanline” people can call if there are “troubles” in their neighborhoods. Police Chief Joseph Massey said the department has received at least six reports of residents finding fliers on their property. They were in bags and weighed down with rocks, which leads Massey to believe they were most likely thrown out of a car window, he said. Massey said that what the KKK stands for “is offensive to a lot of people.” The KKK is a secretive society that was organized in the South after the Civil War. Its members believe in white supremacy, and the group has a long history of violence against blacks, immigrants, Jews and other groups. It wasn’t so long ago that hundreds of Mainers, sometimes thousands, gathered in public halls in Saco, Portland, Hallowell and Rockland to hear polite lectures on the principles of the KKK. The group was once a driving force in Maine, a state where as recently as 1924 membership grew to 40,000 and buoyed itself on anti-Catholic sentiment. By 1930, though, only about 225 Klan members remained. KKK literature appeared in spots throughout Maine in the 1990s, but those were mostly isolated events. While distributing fliers is not a crime, police are trying to find who is now spreading them in Waterville. So far, they have no leads, and none of the residents who received the fliers saw who put them there. Massey said there isn’t a tolerance for this kind of literature in the city, just as there wasn’t for the swastikas that appeared in December 2016 on the large rocks at Quarry Road Recreation Center. In February, about 20 people gathered under light rain on the Margaret Chase Smith Bridges in Skowhegan in response to the distribution of KKK fliers. The rally’s purpose was to show the KKK that it’s not welcome in Maine, organizers said.